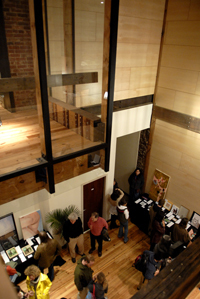 Widely acknowledged as “the coolest building in town”, The Green Building has already hosted some of the state's most exciting and influential organizations, individuals and events since first opening its doors in the fall of 2008, breathing life back into the city's long distressed and forgotten East Market District, also called the NuLu arts district. The mixed-use structure is home to several modern, versatile spaces available for events. The building includes rooms well- suited for cocktail parties, dinners, film screenings, small concerts, and meetings. A partially covered outdoor courtyard offers an excellent gathering space in the warmer months. Rehabilitation of the 110-year old former dry goods store began in 2007, after independent film producer Gill and his urban planner wife Augusta Brown Holland purchased the structure. Intent upon rescuing the building from decades of misuse, the project included resuscitating the structural masonry shell and infusing it with a modern core, including a 40 foot high lobby, expansive natural lighting, eco-friendly materials, renewable energy systems, extensive solar power, geothermal wells, and recycled denim insulation. The Green Building was designed by Los Angeles based architecture firm (fer) studio. Design Principal Doug Pierson, a former Project Architect with Frank Gehry and the Culver City firm, Hodgetts and Fung, Pierson has developed progressive academic, commercial, civic, and residential projects around the world. 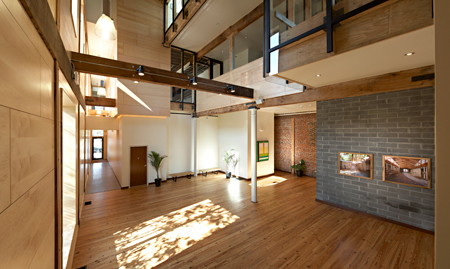 (The Green Building Gallery) and office studios. Want to see how Hannah and Anthony's wedding turned out? Check it out here!